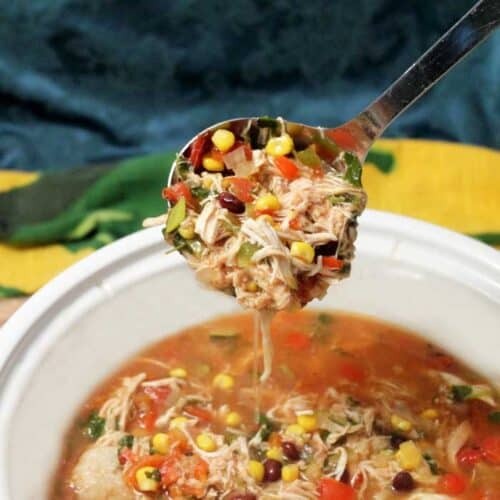 This Crockpot Chicken Tortilla Soup is so easy and it's full of all the delicious flavors associated with Mexican dishes. Just start it in the morning before you leave the house and you've got an awesome tasting hot dinner waiting for you when you get home. And, if your kids are on all different time schedules, it's perfect for single servings too. Season chicken breasts with poultry seasoning, cumin, salt and pepper. Place everything up to and including the chicken broth into crockpot, making sure chicken is completely covered by the broth. Cover and cook on high for 4-1/2 hours or on low for 8 hours. Remove chicken and shred then return to crockpot. Stir in 2 limes, juiced and 1 cup cilantro. Serve in individual bowls topped with shredded cheese, cilantro, chopped onion, avocado, sour cream, crushed tortilla chips and wedge of lime.